When the weather gets cold, I mean really cold it’s the perfect time to thaw out the freezer! Now you might think that this is kind of a Hillbilly way of doing things or you just might think that this is a Genius way of doing things – but I’m telling you it’s how I do things! See once a year when it get cold out for a couple of days in a row it’s the best time to clean out the freezer and thaw it out. 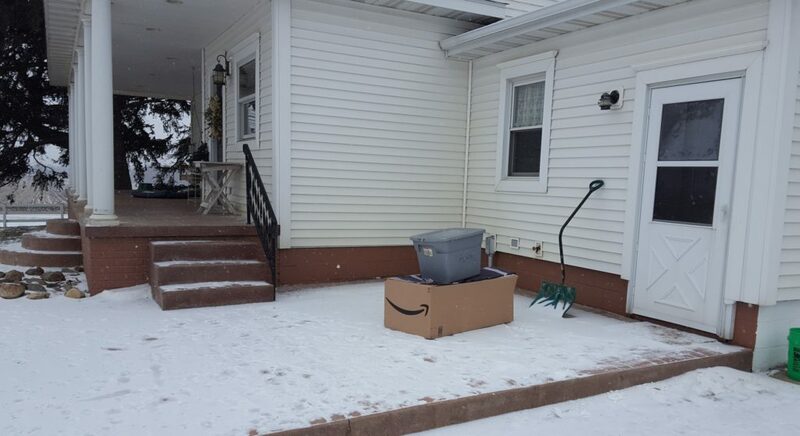 Usually I take a couple of coolers and set them outside, but I had a huge Amazon box from left from Christmas still in the house and it worked perfect! Not only is my goal to get everything out of the freezer so it can thaw, but it gives me a chance to see what I have and what I don’t have for the upcoming year. Now some things that I find are not so good – like carrots that have seen many better days or some celery that I’m not really sure when I put it in there. But then there are some good things that make up for it, like the packages of extra large shrimp that I found – SHAZAM! Or the package of soup bone that I’m looking forward to making some homemade noodle soup with – double SHAZAM! But I have come to realize that I have more than enough vegetables in my freezer than I will ever use in maybe a couple of years or so and I for sure need to get out the tomatoes that were froze last year out sometime and make tomato juice out of it. So with all our food outside in the Amazon box and tote, the freezer is almost thawed and ready to be restocked for the upcoming year. At least I can say that there is one thing good about the weather being at 20 below in the winter, and that’s to get the freezer organized. And seriously that’s about the only good thing about our Iowa weather being this cold! This entry was posted in Projects completed. Bookmark the permalink.